The removal from office of the Somaliland’s Chief Judge, Mr Yusuf Ismael Ali, came just after the recent arrest of the head of the Human Rights Commission in Somaliland, claimed to have been ordered by Mr Ali. Further to this, public complaints have been among the allegations against Mr Ali. 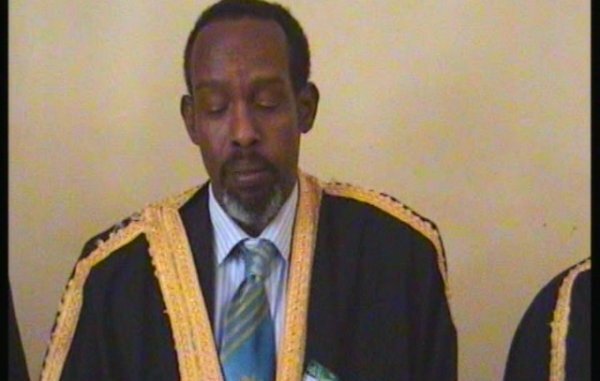 The President of Somaliland’s administration Ahmed Mohamed Mohamud Siilaanyo has fired Chief Judge of High Court Yusuf Ismael Ali on the grounds of complaints from the public and the alleged arrest of Human Rights Commission Chairman on Sunday [19 April 2015], Garowe Online reports. According to a decree from his office, judicial affairs commission members were consulted on the sacking, raising questions over the legitimacy of the move. No successor has been assigned to the top judiciary post. The sacking of Ali comes less than two days after authorities detained Somaliland Human Rights Commission head Gulled Ahmed Jama. Jama’s arrest was allegedly ordered by the sacked Chief Judge of Supreme Court. Similar presidential decree saw former Somaliland High Court Chief Judge Mohamed Hirsi Ismael (Omane) removed in June 2011.